The development of efficacious protein-based therapeutics is often hindered because many exhibit a short plasma half-life. As a result, technologies addressing the extension of protein half-life are attracting considerable attention within the pharmaceutical industry. The challenge of a short plasma half-life often means reduced bioavailability of the drug leading to larger and more frequent dosage regimes for the patient. Risks associated with these treatment protocols, such as increased incidence of side effects and the potential for lack of patient compliance, reduces the efficacy of the therapeutic and associated healthcare benefits. Current strategies employed to extend serum half-life of protein therapeutics include those that increase hydrodynamic volume (PEGylation) or use FcRn-mediated recycling (albumin fusions). Although these techniques have been successful in extending serum half-life, the ability to design protein half-life to deliver the required pharmacokinetics has been lacking. Recognizing these issues Novozymes developed the Albufuse®Flex albumin fusion technology, which offers a flexible drug delivery platform and allows manufacturers to tailor protein or peptide half-life to specific medical needs. By subtle modification of the albumin molecule, the new technology gives drug-development scientists the flexibility to tailor and manage the pharmacokinetics of the target protein while retaining efficacy. In contrast to protein therapeutics, which are generally cleared from the body within a range of minutes to hours, serum albumin displays a long serum half-life of 19 days in humans. Apart from its size protecting albumin from renal clearance, it is the pH-dependent recycling through the neonatal FcRn receptor that is responsible for albumin’s extended half-life. Like IgGs, albumin is taken up by cells through nonspecific pinocytosis and is protected from intracellular degradation through pH-dependent binding to the FcRn in acidic endosomes. 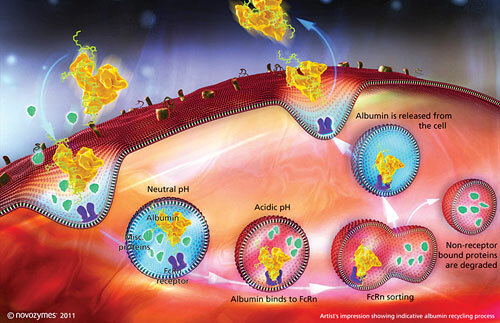 This interaction with the FcRn allows albumin to then be recycled back to the cell surface where it is released into circulation due to the physiological pH of the blood (Figure 1). It is this pH-dependent interaction between albumin and FcRn that is the basis for the technology. The fusion of numerous therapeutically relevant proteins and peptides to albumin using this technology has extended their half-life significantly, resulting in improved pharmacokinetic properties. Understanding the interaction between albumin and FcRn and the impact on albumin half-life has enabled the engineering of this interaction with the potential to modulate albumin’s half-life. Previous studies, which altered the interaction between IgG and FcRn, have been shown to impact the pharmacokinetics of the IgG. Applying these same kinetic principles, the AlbufuseFlex technology is able to modulate protein half-life through construction of albumin variants with altered binding affinity to FcRn. In collaboration with scientists at the University of Oslo, analysis of natural polymorphisms, cross-species binding studies, and sequence alignments have identified potential amino acids involved in the binding of albumin to FcRn. Subsequently, numerous albumin variants have been generated from single amino acid substitutions. Binding affinity studies of each albumin variant to FcRn at acidic pH have identified single amino acid positions capable of generating a range of affinity variants with distinct binding differences. Variants have been measured with both increased and decreased receptor binding affinities potentially translating to modulation of albumin half-life. Although extension of the therapeutic’s half-life is generally pursued, in situations where a drug is highly toxic a reduced plasma half-life may be desirable. It is this flexibility of the technology to modulate albumin half-life that enables drug-development scientists to control and tailor their drug design. Figure 1. Hypothetical model based on knowledge of IgG recycling: The neonatal Fc receptor (FcRn) functions to protect albumin from degradation resulting in prolonged half-life. Chemical coupling or genetic fusion of the therapeutic protein or peptide to the albumin variant with the required half-life can be chosen for each specific application. For the pharmaceutical industry this technology provides an opportunity to deliver new therapeutics that were previously not possible. Lysine, tyrosine, and the free thiol residues of the albumin molecule are used for chemical conjugation to the drug product, with the free thiol at position 34 of albumin being the most widely used conjugation route. This approach is particularly useful for peptides containing maleimide groups, which specifically react with the free thiol, allowing for the formation of a stable thioether bond between albumin and the peptide. Alternatively, proteins can be genetically fused to the N or C terminus or even to both ends of the albumin variant. Using a contiguous cDNA of the target protein or peptide with DNA encoding the albumin variant of choice allows the generation of protein fusions exhibiting the required binding characteristics. The Table, although not exhaustive, outlines the characteristics of either conjugation or fusion technology. As both technologies are suitable with the AlbufuseFlex platform the appropriate technology can be chosen for each specific application. 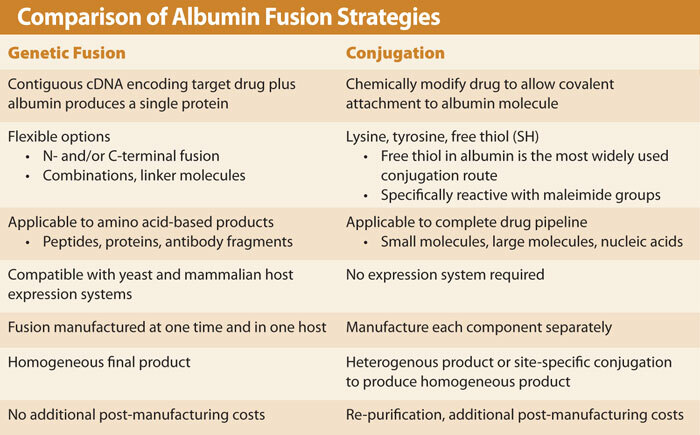 To test that the albumin variants would maintain their modified FcRn binding affinity when fused to a protein or peptide, a range of albumin protein fusions have been generated. The variants chosen displayed a range of binding affinities from low affinity albumins (HSA K500A) to albumins with a 15-fold increase in receptor binding (HSA K573P). 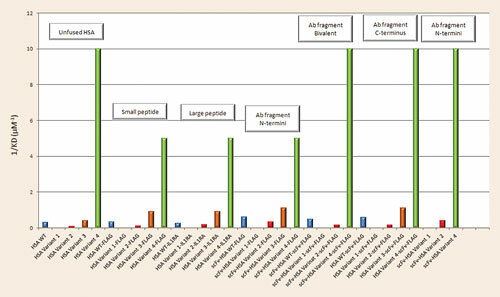 Antibody fragments fused at the C-terminus, N-terminus, or bivalent forms, as well as fusions to small or large peptides were compared to unfused albumin variants for FcRn affinity by SPR using Biacore® technology (Figure 2). All albumin fusions tested showed distinct differences in receptor affinity correlating to their unfused variant. Each fusion demonstrated the same changes in FcRn binding as the control rHSA variant. The flexibility of the technology enables proteins and peptides such as small antibody fragments to be bound at either the C- or N-terminus or both, generating fusion molecules with monovalent, bivalent, or bispecific affinity. In addition to protein- or peptide-based drugs, the enhanced technology also provides a delivery vehicle for small molecules, providing a broad scope of usability. AlbufuseFlex technology enables construction of albumin variants with altered binding affinity to FcRn making it possible to modulate half-life extension of fused target proteins, offering drug developers control and flexibility in their drug design. Figure 2. Albumin variants selected for their different FcRn receptor affinities were genetically fused to a variety of proteins and peptides. Each fusion tested was found to maintain similar affinity for FcRn receptor when compared to the unfused variant. Jason Cameron (JSOC@novozymes.com) is senior research scientist for Novozymes Biopharma.